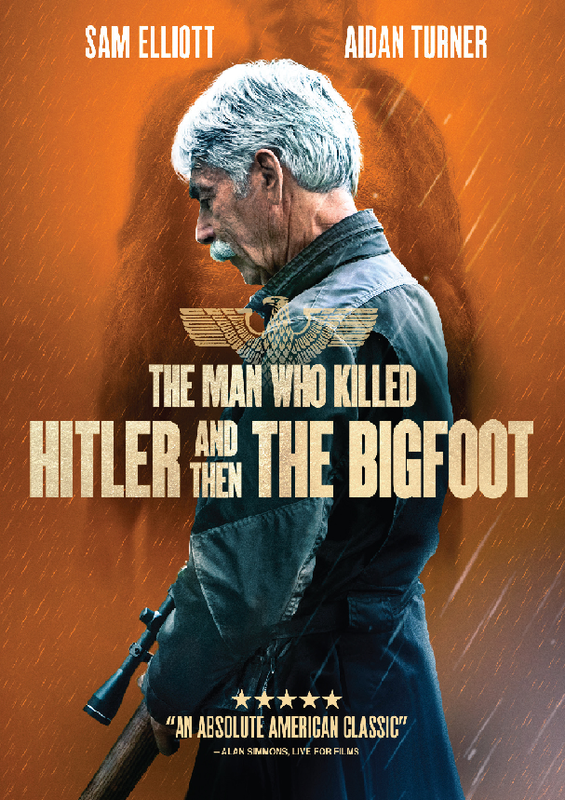 The cover for the DVD for writer-director Robert D. Krzykowski’s action-sci-fi-thriller, ‘The Man Who Kill Hitler and Then The Bigfoot,’ which stars Sam Elliott and Aidan Turner. RLJE Films is unveiling the adventure drama today on DVD and Blu-ray, for an SRP of $29.96 and $29.97, respectively. The discs include the following bonus features: The Making of ‘The Man Who Killed Hitler and Then The Bigfoot;’ Audio Commentary with Writer-Director Robert D. Krzykowski; Deleted Scenes; Elsie Hooper Short Film; Concept Art Gallery; and Composer Joe Kraemer Interview. The DVD and Blu-ray release comes after the distribution company unveiled ‘The Man Who Killed Hitler and Then The Bigfoot’ in theaters, as well as On Digital and On Demand, on February 8. In celebration of ‘The Man Who Killed Hitler and Then The Bigfoot’ home release, Shockya is offering three lucky winners a DVD of the thriller. To enter, email us at ShockyaGiveaway@aol.com. Let us know that you’re entering to win the ‘The Man Who Killed Hitler and Then The Bigfoot’ DVD giveaway in the email’s subject line and message. You have until next Tuesday, April 9, to enter, and you can enter the contest once daily. On April 9, we’ll pick the winners at random, and notify them through email. Good luck! The movie was written by Robert D. Krzykowski, who also made his directorial debut. ‘The Man Who Killed Hitler and Then The Bigfoot’ stars Academy Award nominee, Sam Elliott, Aidan Turner, Ron Livingston, Caitlin FitzGerald, Larry Miller and Ellar Coltrane. ‘The Man Who Killed Hitler and Then The Bigfoot’ follows the epic adventures of an American legend that no one has ever heard of. Since WWII, Calvin Barr (Elliott in the present day of 1987, and Turner in flashbacks from the war) has lived with the secret that he was responsible for the assassination of Adolf Hitler. Now, decades later, the US government has called on him again for a new top-secret mission. Bigfoot has been living deep in the Canadian wilderness and is carrying a deadly plague that is now threatening to spread to the general population. Relying on the same skills that he honed during the war, Calvin must set out to save the free world yet again.